If you’ve ever been stung by a bee you probably got the impression that bees are quite hardy creatures. I accidentally trod on an unsuspecting bee, in bare feet, when I was a kid and his sting was excruciatingly painful. The adults in charge couldn’t seem to decide how best to handle the situation. I suspect they were indulging in a summer drinks session which usually kicked in before sundown. Fortunately a kindly neighbour stepped in and took over. She produced a laundry product that she swore would soothe the bee sting and fix me right up. Jean extravagantly daubed my foot in blue dye – which made the whole event memorably bizarre – but I can’t remember what the hell happened next. I recently read that bees pollinate around about one third of all food crops worldwide. This means that we are dependent on bees because they are such an essential part of the food chain. And they’re crucial to maintaining the biodiversity of the world’s ecosystem (Shannon Harley ‘Hive Minded’ 8 July 2018 THE AGE). According to Harley, bees are not as robust as they seem and their lifecycle is precarious. Take for example the virgin queen bee, she can only be fertilized by male drone bees within twenty days of her birth or she won’t be fertile. And to make it even trickier, as she sets off on her journey to mate with the drones, it’s essential that the day should be pleasantly warm and virtually windless. Bees are very susceptible to temperature and the hive has to be maintained between 33-34 degrees to enable the queen bee to lay her eggs. Small scale bee-keeping is increasing. Australian apiarist, Vicky Brown, maintains over 800,000 bees over several locations. Brown is a co-founder of a unique company called The Urban Beehive and the company install beehives for their clients on Sydney’s rooftops. Rooftop beehives are also becoming increasingly popular in many other cities worldwide. In Australia they’re often installed by restaurant owners, who like to incorporate their premium honey in menu items. Unfortunately, bees are becoming endangered globally because of habitat loss, pesticides, disease and other environmental factors. But according to The Urban Beehive there are a few simple things that we can do to help. Such as eliminating pesticide in urban areas, cultivating plants that flower – especially blue and purple as these colours are especially attractive to bees – and establishing your very own bee hotel. I didn’t know bee hotels existed, but apparently city folk are building them or purchasing them from garden stores. I’m now very keen on becoming the concierge of my very own bee hotel. When I stayed at the Mayfair Hotel in Adelaide, I was delighted to find that they kept beehives on the roof and that the hotel’s special honey – in several varieties – was offered at breakfast. I discovered it was sensational smeared on croissants or toasted breads and washed down with milky coffee. Honey is also used in cocktails up on the hotel’s alfresco rooftop bar. We could order a Honey Trap cocktail and get our calcium, phosphorous, magnesium and selenium that way. And what’s more – while getting pleasantly loaded on essential nutrients – there was a magnificent night view of the city streets and the nearby hills. And a raging electrical storm that provided a touch of danger to the proceedings. Sheer genius. A brief digression for those with inquiring minds; the ‘Honey Trap’ cocktail is a fusion of honey-infused vodka, lime, ginger, mint with a drizzle of raw honey to finish. Napoleon Bonaparte had a thing about bees. He believed the legend that bees didn’t sleep and they were industrious, diligent and orderly. Accordingly Napoleon and his Empress had golden bee decorations crafted onto precious snuff boxes, embroidered on their coronation robes and painted, carved and printed onto walls, wallpapers and doors. Golden bees probably lent an air of legitimacy to Napoleon’s rule, as bees were associated with the ancient kings of France. 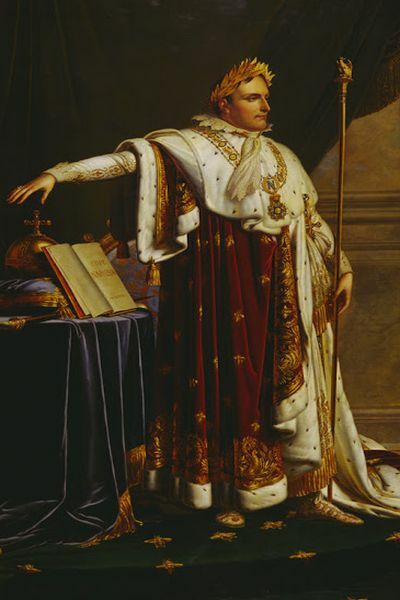 Photograph: Napoleon poses as Emperor of France, painted by Girodet-Trioson. Smothered in embroidered golden bees and standing on a bee motif carpet, Bonaparte’s right hand hovers ominously over the Civil Code, the orb and the hand of justice (it’s lurking under the cushion and looks a bit like a back scratcher).